Amdocs family physicians began serving in the northern Manitoba community of Cross Lake in 2003, followed by clinics in Gods Lake Narrows and then Gods River; on-call telephone assistance was also provided to nurses working in the First Nations communities of Oxford House, Shamattawa, Split Lake, South Indian Lake, Nelson House, Brochet, Lac Brochet, and Tadoule Lake. Amdocs began servicing communities in northwest Ontario in 2006 with a clinic in Pikangikum, followed by Big Trout Lake, Muskrat Dam, and Sioux Lookout. Amdocs’ goal of improving the outcome of northern Canadian disease profiles “one patient at a time” is being achieved through serving the needs of an ever-growing list of communities. For more specific information about Amdocs and the communities in which we are making a positive difference, please contact us directly. As a member of Muskrat Dam First Nation I have been privileged to work as a Community Health Nurse in my home community for the past 2 ½ years. During this time the physician service provided to our Nursing Station has been through AMDOCS. I have been very pleased with the quality and level of physician support we have received from AMDOCS. The physicians who provide medical support to our community have come to know Muskrat Dam and its residents very well which enables them to provide the best medical care possible. As an outpost nurse, I can rely on the staff physicians to know my patients, to be aware of our capabilities, and to be aware of the challenges and limitations of our work environment. It is reassuring to be confident in the medical advice sought for our patients daily. It is this confidence and support that makes my life as a community health nurse enjoyable and rewarding. 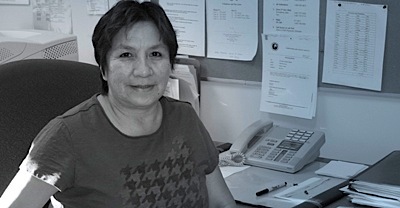 Nellie Beardy, R.N., B.ScAs a member of Muskrat Dam First Nation I have been privileged to work as a Community Health Nurse in my home community for the past 2 ½ years. During this time the physician service provided to our Nursing Station has been through AMDOCS. I have been very pleased with the quality and level of physician support we have received from AMDOCS. The physicians who provide medical support to our community have come to know Muskrat Dam and its residents very well which enables them to provide the best medical care possible. As an outpost nurse, I can rely on the staff physicians to know my patients, to be aware of our capabilities, and to be aware of the challenges and limitations of our work environment. It is reassuring to be confident in the medical advice sought for our patients daily. It is this confidence and support that makes my life as a community health nurse enjoyable and rewarding. “As a member of Muskrat Dam First Nation I have been privileged to work as a Community Health Nurse in my home community for the past 2½ years—during this time the physician service provided to our Nursing Station has been through Amdocs. I have been very pleased with the quality and level of physician support we have received from Amdocs. The physicians who provide medical support to our community have come to know Muskrat Dam and its residents very well which enables them to provide the best medical care possible.